If there's one prominent female figure in the fashion retail world right now who does menswear-inspired dressing better than anyone, it's Banana Republic's Marissa Webb. Our resident stylist does borrowed-from-the-boys dressing so well—and you, dear reader, took notice. We've received a ton of questions centered around how to replicate Webb's signature style, so we decided to pick her brain on the matter. As it turns out, it's not as simple as tossing on a boyfriend blazer and going out the door. "Borrowing from the boys doesn’t always mean literally wearing men's clothing," Webb says. "It's about contrast and proportions. However, I personally do not hesitate to shop in the boys’ section and borrow from my fiancé’s closet. Think of it as your options being doubled!" Keep scrolling to see how Marissa Webb has mastered the menswear-inspired look—and you can too! 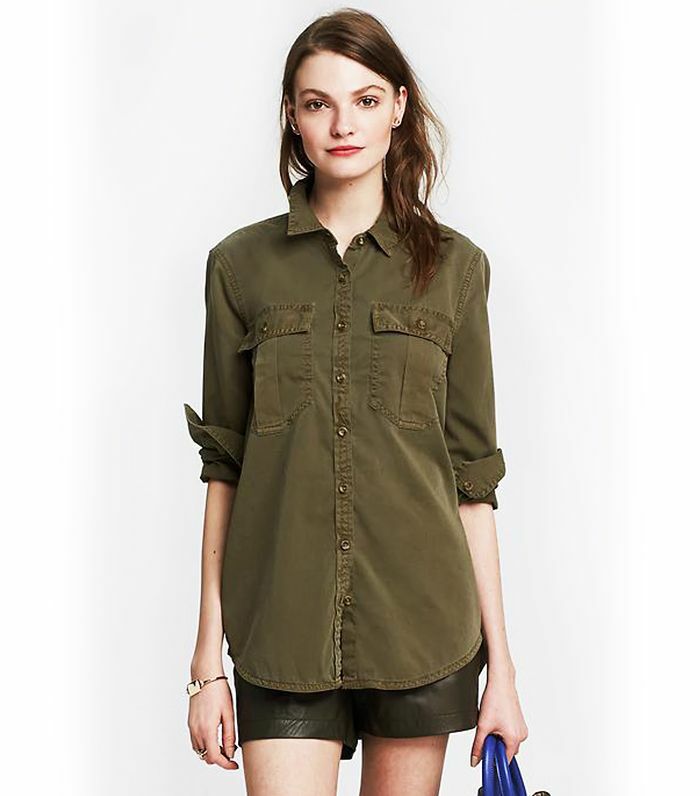 The boyfriend shirt is an easy item to mix into your wardrobe, because the fit is a bit looser and easy. To pull it together, pair it with a skinny skirt or bottom for the juxtaposition of proportion. Then toss on a great pair of heels for that interesting contrast. When styling the boyfriend blazer, it's not always about it just being oversize. It's also about the tailoring and the details. I often pair my “borrowed from the boys” blazer with feminine accessories, like heels or a scoop-neck T-shirt. Or I’ll add a belt to the natural waist to give it more shape. Men's accessories are there for you to explore! I usually use them as an accent with more-feminine items from my closet. Ties and bow ties I’ll mix with a slim button-down or shift dress. Men's watches get mixed in with my other bracelets, and I actually prefer men's perfumes because they’re usually not as powdery and sweet. Sometimes you just want that oversize cosy sweater. I wear mine all year round with skinny jeans, over a silk cami dress, or with shorts on a breezy beach. For me, in order not to look sloppy or like a big sack, it’s the play on contrast and shape that’s important. Mix in your feminine pieces, even if it’s just a bold lip for balance and to separate you from the boys. How do YOU borrow from the boys? Tell us in the comments below!